Getting a used car can be a major risk, especially since even older models still cost thousands. Fortunately, manufacturer-backed Certified Pre-Owned programs help eliminate much of the risk. Toyota’s Certified Pre-Owned program is one of the best thanks to the savings, confidence, and protection it provides. 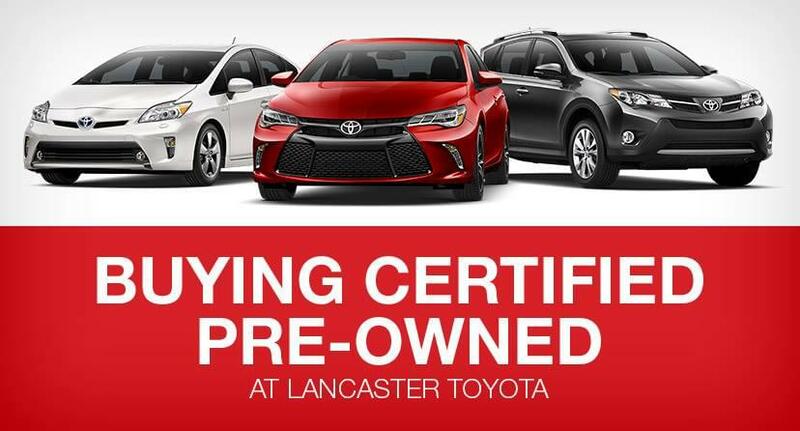 Here are a few reasons why you should by a Certified Pre-Owned vehicle at Lancaster Toyota. Certified Pre-Owned vehicles may cost a little more than their used counterparts, but they come with the knowledge that the vehicle will run for years to come. In the same way, a new car offers that knowledge as well, but at a much higher price. Those savings can allow you to upgrade to a nicer, newer vehicle without breaking your budget. Price is just one area where a Certified Pre-Owned vehicle will save you money. Since used and pre-owned vehicles are likely at least one year old, they cost less to insure. Insurance rates generally scale with how much it will cost to replace the car in the event it ends up totaled. Certified Pre-Owned models aren’t brand new, so it will cost less to replace, resulting in lower rates. Knowing your car will up and running for years to come certainly inspires confidence. Most Certified Pre-Owned programs, including Toyota’s, backs qualifying vehicles with a limited warranty. What’s left of the factory warranty is transferable to you as well! On top of that, each vehicle must go through a rigorous inspection in order to qualify. In the event there is a problem with your newly-purchased Certified Pre-Owned vehicle, have no fear! Toyota’s Certified Pre-Owned program includes roadside assistance coverage for years after the initial purchase. Certified Pre-Owned vehicles represent the best of both used and new vehicles. Boasting a lower price and similar protection, buying a Certified Pre-Owned vehicle is a no-brainer! Stop in at Lancaster Toyota today to see what we can do for you.